I had been having intermittent problems with the CD multichanger a few months after buying the Scorpio and had tried all the tips I had found on the Forum. I even got to a point where I suspected the fault was caused by temperature or humidity as the CD only seemed to work after the car had been standing in the sun! Eventually I got so fed up that I started to find a replacement. After losing a bid on a 5000 series radio and multiplayer I had found on E-Bay, another ‘E-Bayer’ contacted me stating he was just about to place a 7000 series radio and multichanger up for bid and was I interested - of course I was! As it turned out the ‘E-Bayer’ was another ‘Scorpion’ who regularly contributes to the Forum and mailing list, enter Oliver D! “I must warn you it’s not an easy job” was the warning Oliver gave me. So I set about trawling the main site for any information regarding the radio. Peter Barnes’ write up of his experience was great – at least I knew it would fit. “But that was about the 2006 without the amplifier – has yours got the amp fitted? If so, it’s still possible but a bit more tricky getting to the amp” warned Oliver. After 5 minutes deliberation I confirmed the sale! The parcel duly arrived containing the radio, multichanger, cable and a RIM (remote interface module) and so I set about planning the upgrade! As Christmas was looming I decided not to carry out to much electrical work as I needed the car to be working over the holiday, so the first thing was to remove the old CD changer and the cable as the 7000 series uses different connections at the radio end. The changer came out with no trouble (having done this operation many times during the quest to repair it!) but the cable was another matter! The idea was to take the old cable out and replace it with the new. 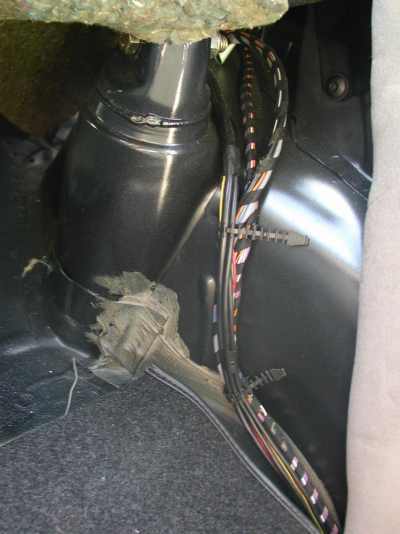 The cable runs from the multichanger up and over the wheel arch back down and under the rear seat into the plastic trim of the passenger side floor pan and then up the pillar in the front passenger foot well where it disappears into the darkness of the dash board. 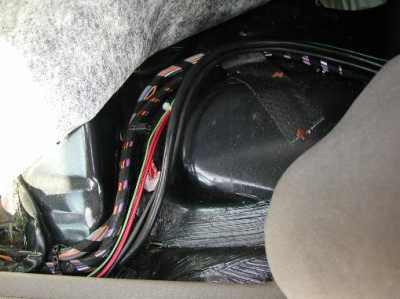 At this point the removal of the glove box is required, this again is simple, by easing off the clips on the hinges on both sides of the glove box and then dropping it down and out! 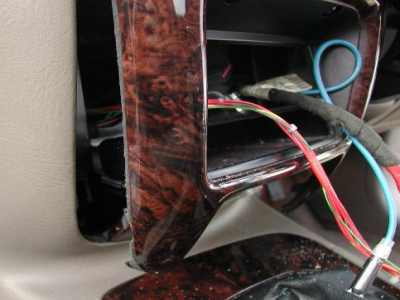 Fitting the new cable was straightforward – using the same route the old cable took and feeding it up and over the glove box compartment and into the space behind the radio. So the changer and cable was in and with Christmas out of the way I could start on the radio! Firstly I wanted to find the connector I needed to access on the amplifier – enter ‘Save the Night’ Bill (or STN as he is also known as!) His first words were “It isn’t easy” but at least he gave me the information I needed. At this point I disconnected the 2007 radio and realized that the aerial socket is different to the 7000, luckily my local motor factors had an adaptor (Standard to ISO) so that was okay. 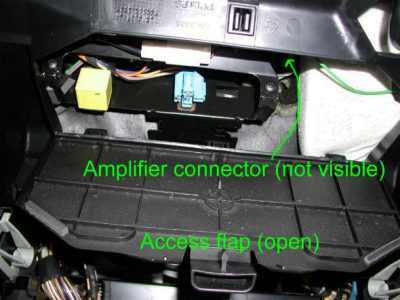 Next was the power connector – they are both the same so again no problem. All that was left on the radio connections was the speaker connector which as STN had pointed out was totally different – this time Halfords came up trumps with one of their range of connectors (PC3-202) was what I needed! 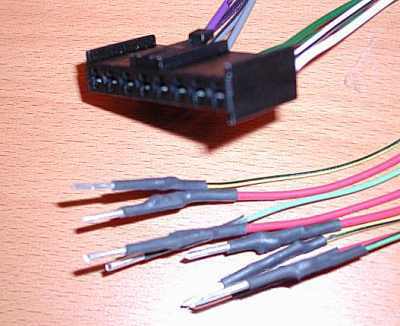 Using the new connector, for the radio end, I spliced on about 2.5 foot of cable to each wire using a simple soldered joint and heat shrink sleeve, this then left me to deal with the end that goes to the connector taken out of the amplifier. 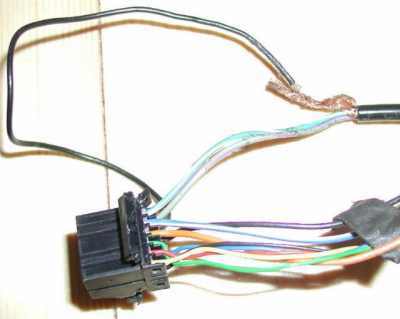 The connector, as STN had warned, was difficult to access and once disconnected did not have much play due to the length of the wires. I didn’t fancy cutting the wires due to the lack of room, so I decided to try and make up some pins that could be inserted in the connector. Some 1.5mm wire, solder, heat shrink and a plaster for the burned finger did the trick. Armed with this information I set about connecting the radio for a final test before fitting. With all the speaker connections made, the aerial and power lead connected I turned it on and entered the security code, the radio ran the normal search for a station found one and I had music to my ears! At this point I plugged in the CD Multichanger and again my favourite music started to play – great all that was needed to do now was to cut the compartment above the ashtray out and fit the unit properly. I really wasn’t looking forward to taking a hack saw to the car, but knowing Peter Barnes had done it gave me the assurance that it is possible. 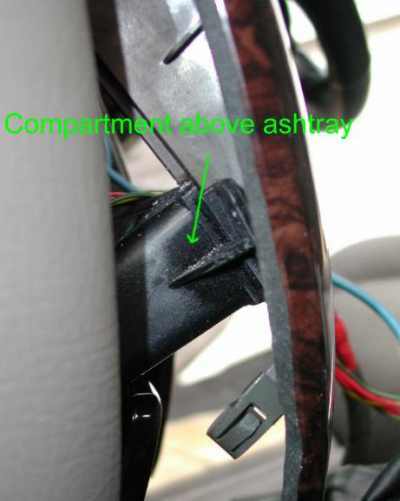 The fake wooden surround of the ashtray and radio pulls forward just enough to allow access with a stubby crosshead screwdriver to the two screws that holds the compartment in place. 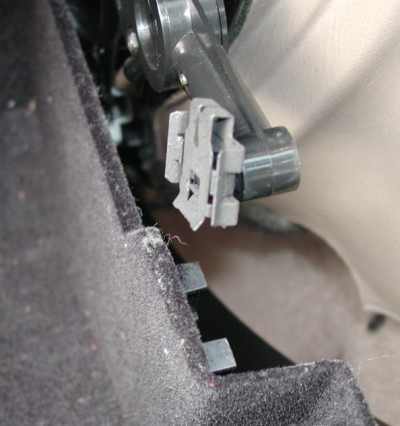 Once removed the piece of plastic that runs between the compartment and radio can be cut out. I also had to file the corners of the new compartment a bit flatter to allow the 7000 radio to slide in and out without too much effort. I finally reconnected the 7000 radio including the yellow RIM connector and switched on. Again all worked fine except the CD, which now gave an error message! 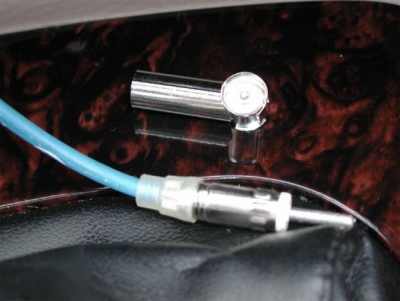 Following another post on the Forum STN came up with the suggestion to take the remote plug out – this cured the problem but left the system without the remote stalk working! 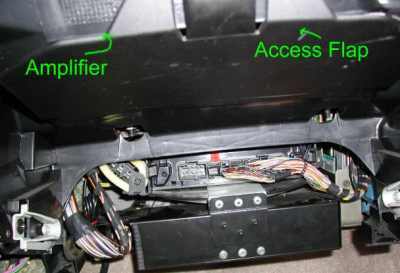 From then on it was a case of elimination – I tried the old 2007 radio, the remote stalk still refused to work, so it must have been either the disconnected amplifier connector or the old CD multichanger loom that I had cut back. I reconnected the amplifier connector – still no joy so I had another close look at the cable I had cut from the old CD multichanger. 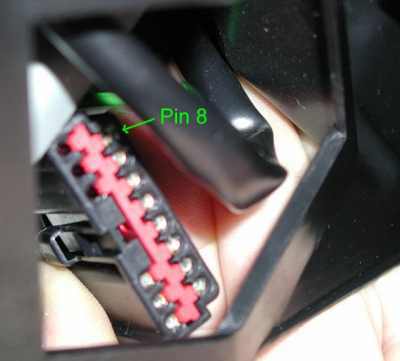 I found that there is a black ground wire that feeds into the multiplug connector and another coming back out that was connected to the shielding on the Black, screened cable in the loom. 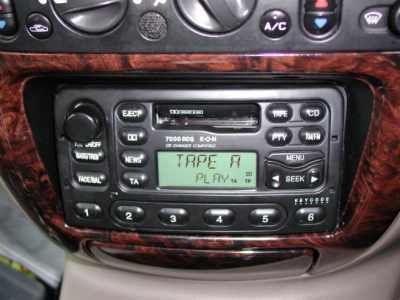 The quality of the join was quite poor – I can’t believe it left the factory with such workmanship but if you are having trouble with the CD player it would be worth checking! Once I made the same connection on the tail of the old loom I had left in the car, I connected the Yellow RIM connector switched on entered the security code and set the CD going, so far so good – next to test the volume – YES it worked, job done! So thanks to "Oliver_D", "Save the Night" and Peter Barnes and anyone else who contributed to my posts and of course the founders of both the Forum and mailing list! Power up radio, enter code and test system.